Several adults are heading to class this fall. But they won’t be learning about traditional subjects. Instead, they will become more knowledgeable about a county agency. For about 20 years, the Prince William County Police Department (PWCPD) has been offering its biannual Citizens Police Academy. The public outreach program is held at the Prince William County Public Safety Training Center in Nokesville. It covers an array of topics — patrols, the hiring process, and the department’s Criminal Investigations Division (CID), to name a few. During one of the 10 sessions, participants learn about special operations, which includes Special Weapons and Tactics (SWAT) and the K9 Unit. “They come out and they explain their units and any kinds of tools of the trade that they use,” Officer Jessica McCauley said. This fall, participants will be spending some time in Woodbridge. “Since the Central District Police Station just opened up, we’re going to have a night over there where they will get to tour the new facility,” McCauley said. According to McCauley, the police department is always accepting applications for the academy. “I was just highly impressed by the information they were providing,” Santana said. It’s important for community members, according to Santana, to become acquainted with those who serve the community — law enforcement, fire and rescue personnel, and elected officials. 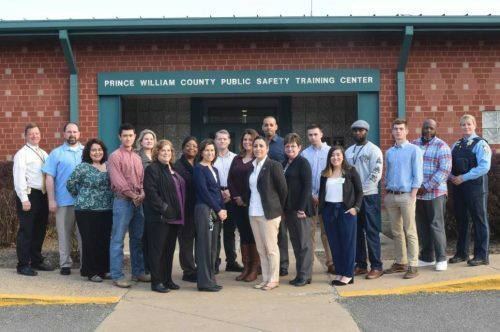 After graduating from the Citizens Police Academy, community members can join the Prince William County Citizen Police Academy Alumni Association (PWCCPAAA). Members of the 23-year-old organization meet throughout the year, according to PWCCPAAA President Jim Hollis. The association also sponsors events, such as the Tribute Service held during National Police Week in May. Through the PWCCPAAA, academy graduates can continue learning about law enforcement. “If they had an initial interest in police operations from recruitment to training to employment, this is a way to continue your interaction with the police department and help support the police department,” Hollis said.